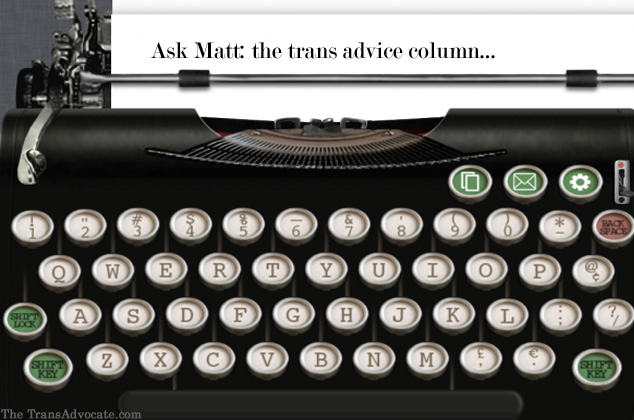 Ask Matt: Should I Come Out or Stay In? “I came out as a transman to myself in 2009, to my (cismale) partner, friends, family, and work from 2010-11, started testosterone in 2011, all in the same town, so to know me as male was to know me as trans. “In the summer of 2012, I moved 900 miles away from everyone I knew to start graduate school in poetry. When I applied, I was excited about exploring my trans identity through poetry and giving back to the community that helped me so much! “Well, I got here, and I immediately found myself in full ‘stealth’ mode. I am happy to be seen as male, no questions, all the time. My partner and I are seen by everyone in our program, campus, and town as a gay male couple. This is exciting – and new – for me, and I figured once I settled in, I would get back to embracing the ‘trans’ part of me … but it has not happened yet. “I have not shown a speck of trans poetry in any class, and I have not come out as trans to anyone here. I feel torn. I have lived about 25 years without being consistently seen as male, without being accepted as a fellow guy, without being able to embrace my self as a feminine queer man (and have it embraced by others), so in some ways, not being out feels great. “On the other hand, I fear that someone will ‘find out’ and that their new knowledge will change our relationship; I feel silenced in my pre-move poetry; and, in a way, I feel I am not being truthful – but what right do they have to ‘know’ what I was assigned at birth? And, sometimes, I feel even more dysphoria, because I compare myself to other cismen – not transmen, as I more often did pre-move. I am on T, yes, but no surgeries for me, for various reasons. This is a dilemma, and I think it’s one that many trans people have. The situation might not be the same, but the underlying confusion and contradictions certainly are. It’s a central problem with a lot of different “branches,” so I think the way to examine it is to break it down into its various components. First of all, let’s look at what you said about feeling that you’re not being truthful. I think this could be a huge factor in the angst and indecision that you’re experiencing right now. Get that out of the way first. You are being truthful. You have been living as a male publicly since 2009, and likely privately – in your head – for many more years than that. I am guessing that your paperwork, or at least some of it, says male. There is no dishonesty here. You have medically transitioned (taking hormones is a medical transition). You are a man. Your surgical status doesn’t matter. Do you know what’s in the pants of all the professors and students there? I hope not. It’s none of your business, just like it’s none of their business what’s in yours. Being trans is just like any other medical condition, and you wouldn’t feel dishonest if you didn’t reveal your colostomy bag or your history of gallstones or your scars from open-heart surgery. Whether you decide to come out or not, the first thing you have to do is somehow lose the feeling that you are being deceitful or dishonest in some way. Even if someone came right up to you and asked if you were trans, you could say no and be telling the truth. Many people who transition do not consider themselves trans after transition. They had a medical problem, they fixed it, it’s over. So I would recommend working on that one, because I think that once you have resolved that in your mind, you will be ready to move on to consider the pros and cons of coming out with regard to your particular situation. The second thing I would look at is coming out itself. You can come out at any time in your life – tomorrow, next year, ten years from now. But once you’re out, it is almost impossible to go back “in.” If you are truly enjoying your life as it is now, then sit back and enjoy it for a while. Coming out and living openly as trans isn’t for everyone. It might not be for you. Or you might decide, at some later date, that it is exactly what you want – and then you can come out. As far as someone finding out, there is always that possibility. And it might not only change the relationship, but it could also spread around campus – people love to gossip, and they find this a very exciting thing to gossip about. Almost all trans people who live “stealth” (a word that I don’t like, because I think, by its very nature, it signals secrecy and possibly deception) live with that possibility. But many people, trans or not, have something in their history that, if it came to light, could change the dynamics of their relationships and has the potential to negatively impact them in some way. If you come out, that could change your relationships with people. If you don’t come out, and someone finds out, that could change your relationships with people. It’s a no-win situation that might not be fair, but it’s one that trans people have to live with. It’s one that you just have to file away under “if it happens, it happens, and I’ll deal with it then” and let it go. It’s one that you have no control over, so there’s no point in worrying about it either way. Say that serenity poem about accepting the things that you can’t change and move on. As for comparing yourself to cisgender men and coming up short – cisgender men compare themselves to cisgender men and come up short. Trans men compare themselves to other trans men and come up short. Try to think back to when you were out as trans at your other school – did you really not ever compare yourself to non-trans men? It sounds to me as if it has more to do with how you think other people see you. Perhaps in your mind, you think that if they know you are trans, they might not expect as much from you with regard to a “manly” presentation, or they might be more “forgiving” of any non-traditional characteristics that you might have. So you might feel more comfortable being out as trans because other people won’t compare you to non-trans men, and then some of the pressure will be off of you to conform to traditional “male” standards of appearance and behavior. Comparing yourself to non-trans men, and the feelings of inadequacy that appear to result from it, seems to me to stem from what you are afraid thatothers are perceiving. But others already see you as a man. So this problem is in your head. Lose this, too. And have you seen some of those hot, hunky trans men out there? There are a lot of non-trans guys that I feel much better comparing myself to. Now we come to probably the most meaningful piece of your dilemma – your poetry. A major goal in your life has been to write poetry as an openly trans man to benefit the trans community and to help other trans guys. Creating poetry, or any kind of art, is the height of personal expression, and you are unable to do it – or you think you are. You have some options. You can publish your poetry under a pen name. Many people have done it and still do it. It’s true that you don’t get the credit or the accolades, but if you later decide to come out, you can take the credit then. You can write your poetry and collect it in a large volume. Then, if and when you decide to come out, you can publish it, and you will have a large and impressive collection. You can also write it and just send it to your friends and family members who know that you are trans. This way, you are still sharing it, getting the feedback, and helping others, while keeping your private life private. The one thing that you shouldn’t do is not write it at all. This is your means of communicating your experiences and it is your creative outlet. If you are a writer, you should write. You end your letter with “What should I do?” I don’t know. Only you know what you should do. But it sounds to me as if you are feeling pretty good about the life you have right now, other than some self-doubt and some guilt. You have nothing to feel guilty about, and you should not doubt the path that you choose, no matter what it is. Whatever you decide, you should go for it and live it to the fullest, enjoying it every step of the way. You have plenty of time. Take it. Examine all of your feelings and then decide on the best course of action for you at this moment. That course of action might change over time. All you have to work with is now. So ask yourself what you want to do right now, today, and then do that.